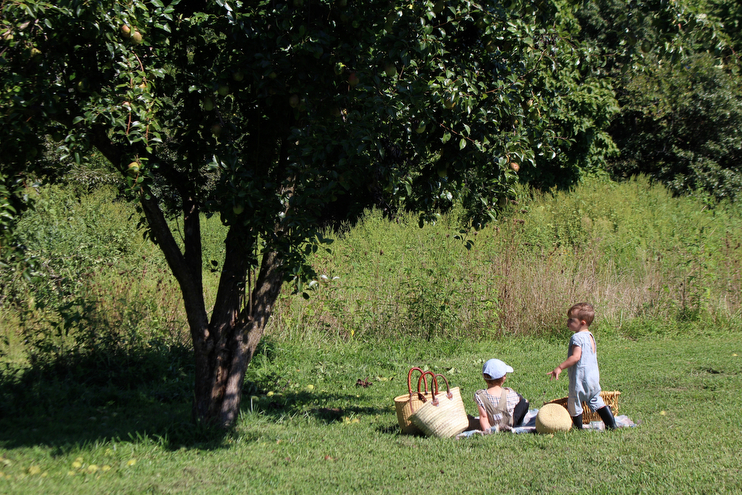 The kids and I went pear and apple picking at Andrew’s sister’s house one sunny afternoon several weeks ago and it was so nice to be able to spend some time out in the fresh country air. 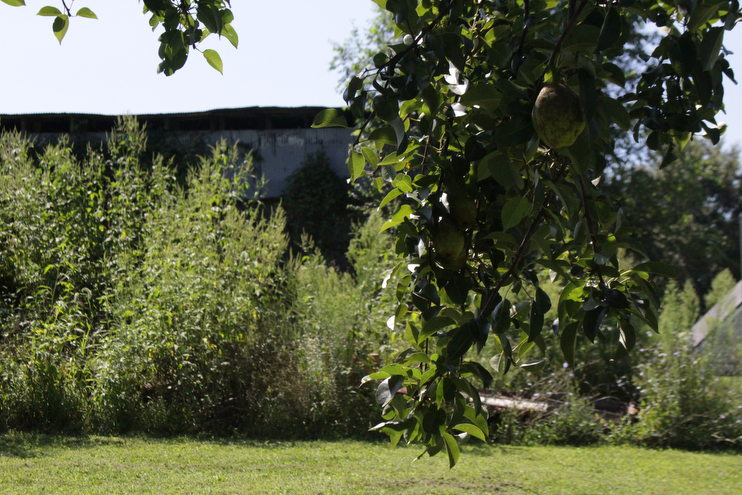 Their sprawling property has several mature apple and pear trees growing on it – lucky for us! – and we got a heads up when the fruit was ready for the pickin’. After nap time we made our way down dusty roads about an hour out of town and spent a few hours picking fruit, shaking limbs, and chasing their cat, Cloud. We barreled home just in time for supper with more apples and pears than we knew what to do with, which is never a problem to have, of course, and that evening I started on a simple crock pot apple sauce and left the pears out on an even surface to fully ripen. After hours of peeling and coring, and several days later mind you, I ended up ordering an apple slicer per some suggestions on Instagram. What a difference that made! Even if you don’t have baskets upon baskets of fruit to peel, core, and slice, I recommend getting one. The kids are even able to use it with my help, just look at that cheeky grin up there! 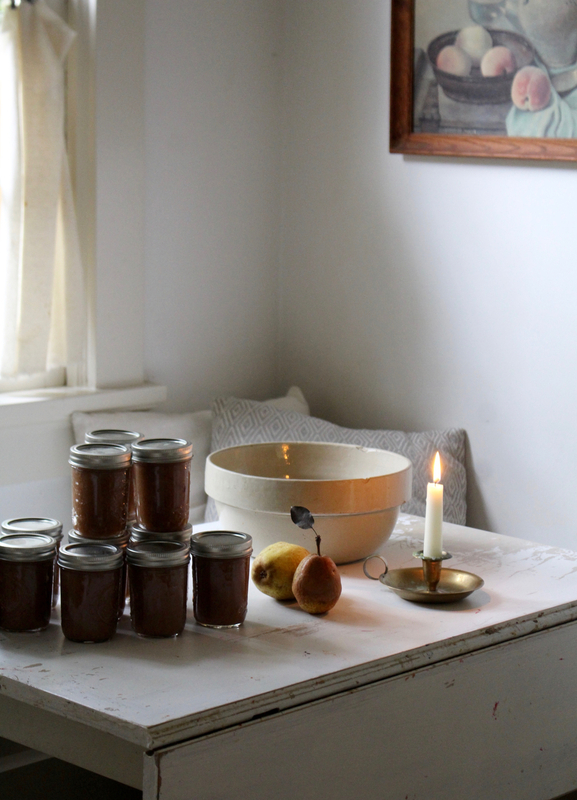 Once our pears fully ripened, I made several different kinds of preserved sauces with those, and then froze some sliced fruit with seasoning for pies later on in the season. My favorite recipe out of the lot was the chai spiced pear sauce, but all of them turned out wonderfully and were worth sharing here with you. In addition to the chai pear sauce (similar to a really yummy applesauce), I also made and preseved rosemary apple butter, cinnamon applesauce, and cardamon pear butter. So much goodness from this year’s harvest! Below are four simple recipes you can use for both apples and pears, and you don’t need a crock pot for them, but I do suggest getting one as we inch towards stew season. Each can be preserved and will last up to one year, or can be refrigerated for up to two weeks. To prepare, mix pears with sugar and add to the crock pot. Pour chai tea concentrate and lemon juice over the pears and cook on low for 6 hours or high for 3 hours. Use an immersion blender to blend to desired consistency. To preserve, see below. To prepare, mix apples with sugar, maple syrup, honey, and cinnamon and add to the crock pot. Pour water (or able juice) and lemon juice over the apples and cook on low for 6 hours or high for 3 hours. Use an immersion blender to blend to desired consistency. To preserve, see below. To prepare, mix pears with sugar, cardamom, and salt and add to the crock pot. Pour lemon juice over the pears and cook on low for 10-12 hours. Use an immersion blender to blend until very smooth. To preserve, see below. To prepare, mix apples with sugar, cinnamon, rosemary, and salt and add to the crock pot. Pour lemon juice over the apples and cook on low for 10-12 hours. Use an immersion blender to blend until very smooth. To preserve, see below. Ladle hot sauce or butter into a hot jar, leaving ¼-inch headspace. Remove air bubbles using a knife or chop stick and wipe jar rim. Center lid on jar and adjust band to finger-tip tight. Place sanitized jar in simmering-water canner. Repeat until all jars are filled and lower the rack into simmering water. Water must cover jars by at least 1 inch. Adjust heat to medium-high, cover canner and bring water to a rolling boil. Process half-pint or pint jars 10 minutes. Turn off heat and remove cover. Let jars cool 5 minutes. Remove jars from canner; do not retighten bands if loose. Cool for 12 hours on a counter and let seals pop! Check seals. Lids should not press up and down when center is pressed. Label and store jars. There you are friends! If you’ve got lots of apples and pears on your hands this season, now you’ve got more than one delicious way to use them up. For those who are wondering just what to do with apple or pear sauce and or butter, you can put on oatmeal or porridge in the mornings, on ice cream at night, slather on buttered toast, melt on pork chops, on top of yogurt with granola, or even eat by the spoon full. Enjoy!